In the 1960s the Singapore government encouraged women, especially uneducated women, to get sterilised following their second child. Population planning in Singapore spans two distinct phases: first to slow and reverse the boom in births that started after World War II; and second, from the 1980s onwards, to encourage parents to have more children because birth numbers had fallen below replacement levels. The first phase was enforced, by Singapore Family Planning and Population Board (SFPPB) Act, in 1966 after Singapore faced “post war food and housing shortages". SFPPB targeted low-socioeconomic status individuals, particularly females, and worked to encourage contraceptive use, such as condoms and birth control. The SFPPB advocated for small families, establishing the "Stop-at-Two" programme, which pushed for small two-children families and promoted sterilisation in order to have population control. SFPPB also opened more clinics to better the health and welfare of families. The government program “Stop-at-Two” was very successful. The program could even be considered too successful. The policy that only allowed couples to have only two children started to cause a population decline and impact the population structure of Singapore in a negative manner. The government has made attempts to reverse the falling birth rates, initiating phase two. Phase two has been very unsuccessful. A lot of policies set in place by the government during phase one made phase two difficult to take place. In phase one, civil workers were not paid for maternity leave after their second child, hospital fees were higher after the second child, top school choices were given to only children, and sterilization was benefited with seven days of paid leave. During phase two, several of these policies were still taking place and individuals remained having one child, or no children. The government eventually became pro-natalist, and officially announced its replacement "Have-Three-or-More (if you can afford it)" in 1987, in which the government continued its efforts to better the quality and quantity of the population while discouraging low-income families from having children. The Social Development Unit (SDU) was also established in 1984 to promote marriage and romance between educated individuals. World War II in Singapore ended in 1945, and the years following caused the population to increase faster than the economy was developing. There were about 1 million baby boomers born between the years of 1947 and 1964, live births increasing 58%. With the rapid increase of Singapore after the war, the country would soon face of the effects of overpopulation, which could be the depletion of natural resources, degradation of environment, a rise in unemployment, and a higher cost of living. From 1947 to 1957, the social forces which caused the post–World War II baby boom elsewhere in the world also occurred in Singapore. The birth rate rose and the death rate fell; the average annual growth rate was 4.4%, of which 1% was due to immigration; Singapore experienced its highest birth rate in 1957 at 42.7 per thousand individuals. (This was also the same year the United States saw its peak birth rate.) Upon Singapore experiencing the many of the effects of overpopulation, and in fear of experiencing more, the Singapore government decided to step in. Family planning was introduced to Singapore in 1949 by a group of volunteers led by Constance Goh that eventually became the Family Planning Association of Singapore and established numerous sexual health clinics offering contraception, treatments for minor gynaecological ailments, and marital advice. Until the 1960s there was no official government policy in these matters, but the postwar British colonial administration, followed by the Singaporean government, played an increasingly important role by providing ever larger grants to the Association, as well as land for its facilities network, culminating in 1960 with a three-month nationwide family planning campaign that was jointly conducted by the Association and government. The population growth rate slowed from 4–5% per year in the 1950s to around 2.5% in 1965 around independence. The birth rate had fallen to 29.5 per thousand individuals, and the natural growth rate had fallen to 2.5%. At the time of independence, many Singaporeans lived in the Central Area in overcrowded shophouses; and the bulk of the work of the Housing Development Board had not yet been completed. In 1947, the British Housing Committee Report noted Singapore had "one of the world's worst slums – 'a disgrace to a civilised community'", and the average person per building density was 18.2 by 1947 (high-rise buildings had yet to be constructed en masse); about 550,000 people lived in squalid squatter settlements or "ramshackle shophouses" by 1966. Rapid population growth was perceived as a threat to "political stability and living standards" that led to population overcrowding that would overwhelm employment opportunities and social services in education, health and sanitation. Despite their fall since 1957, birth rates in the 1960s were still perceived as high. On average, a baby was born every 11 minutes in 1965; Kandang Kerbau Hospital (KKH) – a women's hospital where most babies in Singapore were delivered – saw over 100 deliveries per day in 1962. In 1966, KKH delivered 39,835 babies, earning it a place in the Guinness Book of World Records for "largest number of births in a single maternity facility" each year for ten years. Because there was generally a massive shortage of beds in that era, mothers with routine deliveries were discharged from hospitals within 24 hours. In 1959, the People's Action Party came to power, and in September 1965 the Minister for Health, Yong Nyuk Lin, submitted a white paper to Parliament, recommending a Five-year Mass Family Planning programme that would reduce the birth rate to 20.0 per thousand individuals by 1970. This was to become the National Family Programme; in 1966, the Family Planning and Population Board (FPPB) had been established based on the findings of the white paper, providing clinical services and public education on family planning. Initially allocated a budget of $1 million SGD for the entire programme, the FPPB faced a resistant population, but eventually serviced over 156,000. The Family Planning Association was absorbed into the activities of the FPPB. Lee Kuan Yew as first Prime Minister of Singapore held wide sway over the government's social policies before 1990. Lee Kuan Yew was recorded in 1967 as believing that "five percent" of a society's population, "who are more than ordinarily endowed physically and mentally," should be allocated the best of a country's limited resources to provide "a catalyst" for that society's progress. Such a policy for Singapore would "ensure that Singapore shall maintain its pre-eminent place" in Southeast Asia. Similar views shaped education policy and meritocracy in Singapore. In the late 1960s, Singapore was a developing nation and had not yet undergone the demographic transition; though birth rates fell from 1957 to 1970, in 1970, birth rates rose as women who were themselves the product of the postwar baby boom reached maturity. Fearing that Singapore's growing population might overburden the developing economy, Lee started a vigorous Stop at Two family planning campaign. 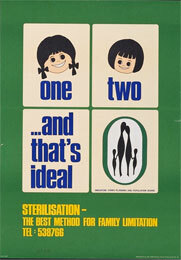 Abortion and sterilisation were legalised in 1970, and women were urged to get sterilised after their second child. Women without O-Level qualifications, deemed low-income and lowly educated, were offered by the government seven days' paid sick leave and $10,000 SGD in cash incentives to voluntarily undergo the procedure. Hospitals were required to charge incrementally higher fees for each additional child. Large families were penalised in housing assignments. Top priority in top-tier primary schools would be given only to children whose parents had been sterilised before the age of forty. The government created a large array of public education material for the Stop-at-Two campaign, in one of the early examples of the public social engineering campaigns the government would continue to implement (Speak Mandarin, Speak Good English, National Courtesy, Keep Singapore Clean and Toilet Flushing Campaigns) that would lead to its reputation as "paternalistic" and "interventionist" in social affairs. The "Stop at Two" media campaign from 1970 to 1976 was led by Basskaran Nair, press section head of the Ministry of Culture, and created posters with lasting legacy: a 2008 Straits Times article wrote, "many middle-aged Singaporeans will remember the poster of two cute girls sharing an umbrella and an apple: The umbrella fit two nicely. Three would have been a crowd." This same poster was also referred to in Prime Minister Lee Hsien Loong's 2008 National Day Rally speech. Many other posters from the "iconic" campaign included similar themes of being content with two girls, to combat the common trend in developing Asian societies for families with only daughters to continue "trying for a boy". "Teenage marriage means rushing into problems: A happy marriage is worth waiting for"
"Take your time to say 'yes'"
The Straits Times interviewed mothers who were sterilised in that era, noting it was common to get sterilised at a young age, citing a woman who had undergone tubal ligation at KKH at the age of 23, herself coming from a large family of ten. "The pressure [disincentives] was high. The Government clearly didn't want us to have more than two." A gynaecologist doctor who worked KKH recalled sterilisation rates became "sky high" after the disincentives had been implemented; it was common for hospital workers to chide women who were pregnant with third-order or higher births, recommending abortions, while such women talked about their pregnancy "[as if] they committed a crime". The Straits Times also suggested the disincentives had been very effective; one woman cited how sterilisation certification had to be shown to a school for a third child to receive priority, while she and four out of five sisters eventually underwent sterilisation. Expensive delivery fees ("accouchement fees") for third-order and higher births would also be waived with sterilisation. The campaign was known to target the uneducated in particular; Lee believed that, "Free education and subsidised housing lead to a situation where the less economically productive people ... are reproducing themselves at [a higher rate]." He believed that implementing a system of government disincentives would stop "the irresponsible, the social delinquents" from thinking that having more children would entitle them to more government-provided social services. The government justified its social policy as a means of encouraging the poor to concentrate their limited resources on nurturing their existing children, making them more likely to be capable, productive citizens. The government also had to respond to criticism that this policy favoured Chinese over minority races; Malays and Indians were stereotyped to have higher birth rates and bigger families than the Chinese, further fuelling accusations of eugenics. As Singapore modernised in the 1970s, fertility continued to drop. The natural replacement rate reached 1.006 in 1975; thereafter the replacement rate would drop below unity. Furthermore, the so-called "demographic gift" was occurring in Singapore as with other countries; increases in income, education and health and the role of women in the workforce were strongly correlated to levels of low population growth. According to a paper by the Library of Congress, by the 1980s, "Singapore's vital statistics resembled those of other countries with comparable income levels but without Singapore's publicity campaigns and elaborate array of administrative incentives." Equal employment opportunities, yes, but we shouldn't get our women into jobs where they cannot, at the same time, be mothers...our most valuable asset is in the ability of our people, yet we are frittering away this asset through the unintended consequences of changes in our education policy and equal career opportunities for women. This has affected their traditional role ... as mothers, the creators and protectors of the next generation. In 1985, especially controversial portions of the policy that gave education and housing priorities to educated women were eventually abandoned or modified. A 1992 study noted that 61% of women giving birth had secondary education or higher, but this proportion dropped for third-order births (52%) and fourth-or-higher-order births (36%), supporting the idea that more children per capita continue to be born to women with less qualifications, and correspondingly, lower income. This issue is greatly known as the Great Marriage Debate. Many incentives were given to graduate women to marry and give birth to produce babies which were believed to be 'highly intelligent' to maximise the talent pool in Singapore. In 1986 the Government of Singapore had recognised that falling birth rates were a serious problem and began to reverse its past policy of Stop-at-Two, encouraging higher birth rates instead. By 30 June of that year, the authorities had abolished the Family Planning and Population Board, and by 1987, the total fertility rate had dropped to 1.44. That year, Goh Chok Tong announced a new slogan: Have Three or More (if you can afford it), announcing that the government now promoted a larger family size of three or more children for married couples who could afford them, and promoted "the joys of marriage and parenthood". The new policy took into account Singapore's falling fertility rate and its increased proportion of the elderly, but was still concerned with the "disproportionate procreation" of the educated versus the uneducated, and discouraged having more than two children if the couple did not have sufficient income, to minimise the amount of welfare aid spent on such families. The government also relaxed its immigration policies. In October 1987, future Prime Minister Lee Hsien Loong, then a young Brigadier-General, exhorted Singaporeans to procreate rather than "passively watch ourselves going extinct". United Press International noted the "baffled" reaction of parents, many who had grown up in an era where they were told that having more than two children was "antisocial". One parent commented, "are we being told to have more children for the sake of the country or for ourselves?" Goh Chok Tong, despite the scepticism, remained optimistic that the population rate would be restored to the replacement rate by 1995. An NUS sociologist however, observed that Singapore had "a new breed of women" – one "involved in their careers [and] used to a certain amount of leisure and more material possessions" – and hence would not be as receptive to financial incentives as previous women of the 1960s and the 1970s. As of 2011[update], Singapore's birth rate has not yet been restored to replacement level. Mothers with a third child would get 750 SGD in child relief (factoring historic exchange rates, this was about $662 in 2010 US dollars). If a mother had three 'O'-level passes in one sitting, she would qualify for an enhanced child relief rebate (lowered from a threshold of five passes). Having a fourth child would qualify for enhanced child relief of 750 SGD plus 15% of the mother's income, up to 10000 SGD. All disincentives and penalties given in school registration to families with more than two children are to be removed; in the presence of competition, priority would be allocated to families with more than two children. Starting 1993, the sterilisation cash grant for lowly educated women was liberalised, allowing women to agree to use reversible contraception rather than sterilisation; educational bursaries for existing children were added as existing benefits, so long as the number did not exceed two. Phase Two started in the early 1960s. The natural rate of increase (per 1,000 population) between the years of 1955–1960 (five years previous to phase two) was 35.4. Five to ten years later, the natural rate of increase decreased to 27.8. Following that, 20 years later the natural rate of increase continued to decline. The natural rate of increase between the time period of 1980–1985, was 12.2, and several years after that, between the years of 2010–2015 the natural rate of increase, continued decreased to 4.6. The lowest natural rate of increase seen in Singapore and according to the data of the United Nations (2017) will continue to decline. The rate of natural increase in Singapore is forecasted to decrease to 1.2 between the period of 2025–2030. The modern SDU, renamed the Social Development Network in 2009, encourages all Singaporean couples to procreate and marry to reverse Singapore's negative replacement rate. Some of the social welfare, dating and marriage encouragement, and family planning policies are also managed by the Ministry of Community Development, Youth and Sports. Channel NewsAsia reported in January 2011 that the fertility rate of Singaporeans in 2010 were 1.02 for Chinese, 1.13 for Indians and 1.65 for Malays. In 2008, Lee Kuan Yew said the below-national-average birth rate for the Chinese was a "worrying trend". That same year, he was quoted as saying, "[If] you marry a non-graduate, then you are going to worry if your son or daughter is going to make it to the university." Different sources have offered differing judgments on the government policies' impact on the population structure of Singapore. While most agree that the policies have been very interventionist, comprehensive and broad, the Library of Congress Country Study argues "it is impossible to separate the effects of government policies from the broader socioeconomic forces promoting later marriage and smaller families," suggesting that the government could only work with or work against much more powerful natural demographic trends. To the researchers of the study, the methods used in 1987 to attempt to reverse the falling birth rate was a demonstration of "the government's [continued] assumption" that citizens were receptive towards monetary incentives and administrative allocation of social services when it came to family planning. However Saw Swee Hock, a statistician and demographer quoted in the Straits Times in 2008, argued the demographic transition "was rapid because of the government's strong population control measures," but also admitted that, "even without the Stop at Two policy, the [total fertility rate] would have gone below 2.1 due to [the demographic transition]." When demographic transition statistics are examined – in 1960, the total fertility rate was approximately ~6 – Asian MetaCentre researcher Theresa Wong notes that Singaporean birth rates and death rates fell dramatically in a period that occurred over "much shorter time period than in Western countries," yet such a short time frame is also seen in other Southeast Asian countries, where family planning campaigns were much less aggressive. According to Saw Swee Hock, "the measures were comprehensive and strong, but they weren't reversed quickly enough". Though newer modern policies exhibit "signs that the government is beginning to recognise the ineffectiveness of a purely monetary approach to increasing birth rates", a former civil servant noted that the government needs "to learn to fine-tune to the emotions rather than to dollars and cents. It should appeal more to the sense of fulfilment of having children". Such measures include promoting workplaces that encourage spending time with the family, and creating a "Romancing Singapore Campaign" that "[directly avoided being linked] to pro-children and pro-family initiatives," since "people get turned off" when the government appears to intervene in such intimate social affairs as marriage. However, this is still seen by some citizens as "trivialising" love and "emotional expression", which "should not be engineered". In 2001, the government announced a Baby Bonus scheme, which paid $9000 SGD for the second child and $18000 for the third child over six years to "defray the costs of having children", and would match "dollar for dollar" what money parents would put into a Child Development Account (CDA) up to $6000 and $12000 for the second and third child respectively. In 2002, Goh Chok Tong advised "pragmatic" late marriers "to act fast. The timing is good now to get a choice flat to start a family." ^ a b c "Singapore Family Planning & Population Board is established - Singapore History". eresources.nlb.gov.sg. Retrieved 2018-03-22. ^ YOUNGBLOOD, RUTH (1987-06-21). "'Stop at 2' Campaign Works Too Well; Singapore Urges New Baby Boom". Los Angeles Times. ISSN 0458-3035. Retrieved 2018-03-22. ^ "SLOW Movement: ST: Two is not enough". chutzpah.typepad.com. Retrieved 2018-03-22. ^ a b c "Singapore Population Control Policies - Flags, Maps, Economy, History, Climate, Natural Resources, Current Issues, International Agreements, Population, Social Statistics, Political System". photius.com. Retrieved 2018-03-22. ^ Wong, Theresa. "Fertility and the Family: An Overview of Pronatalist Population Policies in Singapore". ^ a b ""Baby Boom Generation in Singapore and its Impact of Ageing"". Engineering and Technology International Journal of Humanities and Social Sciences. 8: 809–817. 2014. ^ Mui, Teng Yap (2007). "Singapore: Population Policies and Programs". In . Robinson, Warren C; Ross, John A. The global family planning revolution: three decades of population policies and programs. World Bank Publications. pp. 201–219. ISBN 978-0-8213-6951-7. ^ a b c d e f Wong, Theresa; Brenda Yeoh (2003). "Fertility and the Family: An Overview of Pro-natalist Population Policies in Singapore" (PDF). ASIAN METACENTRE RESEARCH PAPER SERIES (12). ^ Yuen, Belinda (November 2007). "Squatters no more: Singapore social housing". Global Urban Development Magazine. 3 (1). ^ a b c d e f g h i j k "Singapore: Population Control Policies". Library of Congress Country Studies (1989). Library of Congress. Retrieved 11 August 2011. ^ a b "Family Planning". National Archives. Government of Singapore. Retrieved 12 August 2011. ^ Diane K. Mauzy, Robert Stephen Milne, Singapore politics under the People's Action Party (Routledge, 2002). ^ a b c d Mui, Teng Yap (1995). "Singapore's 'Three or More' Policy: The First Five Years". Asia-Pacific Population Journal. 10 (4): 39–52. Retrieved 11 August 2011. ^ a b Jacobson, Mark (January 2010). "The Singapore Solution". National Geographic Magazine. Retrieved 26 December 2009. ^ "Poster Collection". Singapore Collection. Lee Kong Chian Reference Library. Retrieved 12 August 2011. ^ a b c d Toh, Mavis (24 August 2008). "ST: Two is not enough". The Straits Times. Retrieved 12 August 2011. ^ a b c Chee, Soon Juan (2008). A Nation Cheated. ISBN 981-08-0819-4. ^ a b Webb, Sara (26 April 2006). "Pushing for babies: S'pore fights fertility decline". Reuters. Retrieved 11 August 2011. ^ "SINGAPORE FAMILY PLANNING AND POPULATION BOARD(REPEAL) ACT". Singapore Statutes. Parliament of Singapore. Retrieved 12 August 2011. ^ "Singapore – Government". Country Studies Program. Library of Congress. Retrieved 11 August 2011. ^ Youngblood, Ruth (21 June 1987). " "'Stop at 2' Campaign Works Too Well; Singapore Urges New Baby Boom". United Press International. Retrieved 17 August 2011. ^ "Department of Statistics, Singapore. Infographic on Crude Birth Rate" (PDF). www.singstat.gov.sg. Archived from the original (PDF) on 10 August 2014. Retrieved 4 August 2014. ^ a b c "World Population Prospects - Population Division - United Nations". esa.un.org. Retrieved 2018-04-11. ^ De Souza, Ca-Mie (17 August 2008). "Chinese community assured, new initiatives for Malay/Muslims". Channel NewsAsia. Retrieved 11 August 2011. ^ "Eugenics in Singapore". Your SDP. 9 November 2008. Retrieved 11 August 2011. ^ "Opening of Parliament". Singapore Parliamentary Proceedings. Parliament of Singapore. Archived from the original on 16 August 2011. This page was last edited on 13 March 2019, at 12:48 (UTC).